Ryan Brown Sets NC 2K Steeple State Record At Dogwood TC! Back in 2002 Kalib Wilkinson (North Mecklenburg) clocked 6:06.07 to set the standard in the 2000m Steeplechase in North Carolina at adidas Outdoor Nationals. Earlier this year Hunter White (North Henderson) and Ryan Brown (Broughton) showed promise in challenging his record running 6:08.17 and 6:13.95 respectively. Tonight Brown took on his second steeple field of the year at the Dogwood Track Classic where he and teammate Jacob Wells were the top seeds in the event with a lot of Virginia distance talent. Brown sat in on the leader through the first lap, but took over the pace from there. Brown was looking very smooth over the hurdles early in the race and each lap he continued to push the pace. Last year the meet record was set by Ben Fleming (Blacksburg HS) set the meet record of 6:12.04, and Brown was on clear pace to shatter that meet record. Brown went through the 1600 at approximately 4:52 with about a 50 meter lead over Wells who sat in second about 10 meters ahead of 3rd. Brown was racing the clock and certainly had the state record in site. Brown clear the remaining hurdles with ease powering down the homestretch in 6:03.48 setting a new state record by just under 3 seconds. Wells came in 2nd in the race running 6:15.13, good for NC#8 All-Time. 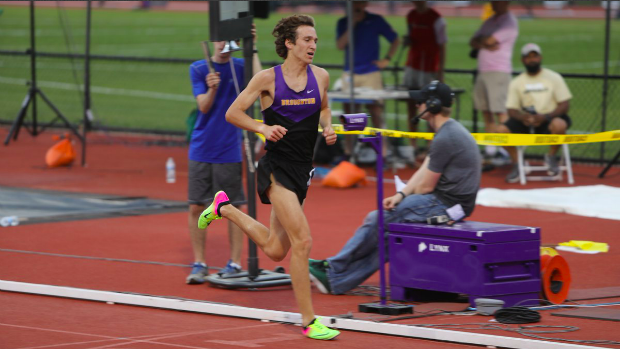 The time broke the Dogwood Track Classic Meet Record by 9 seconds and currently US#2 behind reigning New Balance Outdoor Champion Shane Henderson out of Wyoming. Brown practices hurdles during workouts at Broughton HS, but doesn't really get to practice the water jump, which can make or break the steeplechase. Brown and Wells have both qualified for New Balance Outdoor Nationals, and both have potential of bringing home an All-American performance, and said in interview that he hopes to bring home a top 3 finish and a sub 6 finish. Brown will bounce back in the 1600 tomorrow looking to run under 4:20 for the first time.